Mega, a web-based service that lets people upload and store files of any kind, is a sequel to the Megaupload system that was shut down last January. Police raids on the offices and home of Kim Dotcom led to the closure of Megaupload. The Mega site went online on Sunday, followed by a lavish launch party held at Mr Dotcom’s New Zealand mansion. Mr Dotcom, who was born Kim Schmitz, has said the new site complies with the law and warned that attempts to take it down would be futile. “This is not some kind of finger to the US government or to Hollywood,” he said on Saturday. Hours after the site was launched, Mr Dotcom tweeted that it had received 250,000 user registrations, although limited server capacity meant Mega was unreachable to many. In a series of earlier tweets Mr Dotcom said every customer would have 50 gigabytes of free storage – far more than is offered by rival services such as Dropbox or Microsoft’s SkyDrive. Mega will be encrypted so only those who upload data have access to it. Data is also being held in the cloud to make it easy for users to get and share files. The 2012 raids on Megaupload were carried out because, said US law enforcement, many users of Megaupload were engaged in pirating content and illegally sharing it. They accused Mr Dotcom, and other managers at Megaupload of profiting from piracy. At the launch party for Mega, Mr Dotcom made light of the incident, re-enacting the raid on his mansion by New Zealand authorities with a helicopter and actors dressed as armed police. 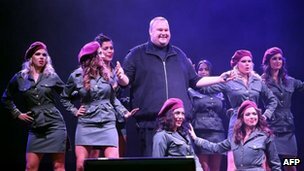 He has rebuffed the accusations of piracy and is fighting a legal battle to stay in New Zealand from where he ran Megaupload. A hearing on whether he can be extradited to the US has now been delayed until August. The case has generated controversy in New Zealand over the way the police and intelligence services gathered evidence before the raid and won an apology to Mr Dotcom from the country’s prime minister. Mr Dotcom has also won support from prominent computer pioneers such as Apple co-founder Steve Wozniak. The raid on Megaupload put 25 petabytes of data uploaded to it by its 50 million members into a legal limbo.